an abnormal oval or elliptical erythrocyte, as seen in elliptocytosis. Called also ovalocyte. /el·lip·to·cyte/ (e-lip´to-sīt) an oval or elliptical erythrocyte. an oval red blood cell. See also elliptocytosis, ovalocytes, ovalocytosis. An elliptic red blood corpuscle found normally in the lower vertebrates with the exception of Cyclostomata; in mammals it normally occurs only in camels, hence cameloid cell. an oval-shaped erythrocyte. Seen in non-mammalian species and members of the Camelidae family. Called also ovalocyte. In severe cases, elliptocytes may accompany microcytes and hypochromic red cells on blood films. Blood films showed a normochromic picture with irregularly shaped cells, elliptocytes, and erythrocyte fragments suggestive of an erythrocyte membrane defect. Rodgers MS, Cheng C, Kass L Elliptocytes and tailed poikilocytes correlate with severity of iron-deficiency anemia. 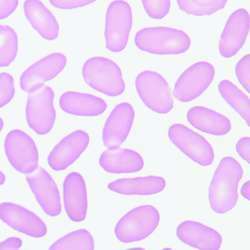 Are they microcytes or macrocytes? Can we do a better job? We've eliminated "occ'l" when describing elliptocytes, target cells, burr cells, schistocytes, acanthocytes, and teardrop cells.